Summer Swarm – Summer has almost run away with us, so it’s going to be a Start of Autumn Swarm to begin the new orienteering year! The next Bushies Swarm will be held at the home of Toni Brown and David Poland on Friday 1st March, 2019. A Pot Luck meal (BBQ facilities will be available). Please bring a dish/a salad/a plate to share (sweet or savoury), and your own drinks. The club will provide breads and fruit as well. At this first Swarm of the year we meet to share orienteering stories from the holidays, welcome new members, and celebrate some Club successes. The Ian Booth Award for the most improved Bushflyer at Masters level (based on ACT League Events) and the 2018 Orienteering Australia Merit Badges will be presented, as well other special annual awards (see Call for Nominations below).
) with these as well. It is my pleasure to welcome our new members to the club: some of you joined late last year, and others earlier this year. In particular, welcome back to Phil Creaser, and welcome to Callum Bennett; Mark Jillard; Alicia Robertson; Sabrina Sonntag, Xavier and Jordi Canadell; Ken, Vicky, Joshua and Ben Mansell; Yumi Ezaki, Christopher Swain, Emily and Kai Ezaki-Swain; and Nicki Bramley and Reuben Vassiliou-Bramley. At this stage of the year we are updating members’ details. Please check that we have the correct contacts for you. This email is coming to you through last year’s email list (updated!). This will have errors, of course. While I am doing my best to include all new members, it is important that you ensure that we have the correct details for everyone. Would you please let Valerie know if there are errors, discrepancies or omissions. Bushies Uniforms – New Order Details Here! 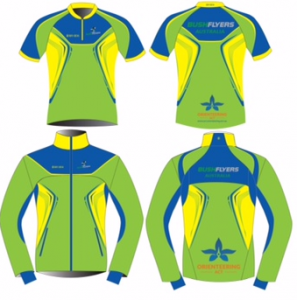 Last year we redesigned our Bushies O-top, and also introduced a Club jacket. Both look great and we have received quite a few compliments. If you would like to place an order, read on!
) by SUNDAY 3rd MARCH. This should mean that we have our new O-tops by mid to late April, possibly by Easter and certainly before the OACT Saturday Metro Series starts. I will order a few extra, in case of sizing problems, but in general, it is not easy to exchange tops. Cost: $65 – or possibly less, depending on the quantity ordered. Arrangement for payments for tops will follow. Sizing – this is always the tricky part, unfortunately. You might like to go to the Siven (Bryzoz) website https://www.bryzosport.com/size-chart , especially if you have never had a Siven (or Trimtex) shirt before. If you have a Trimtex shirt, the sizing will be similar. In general, you are recommended to err on the side of ordering a size larger than you might usually choose. As a rough guide (for women), I wear Trimtex Women’s Small, I have a Siven XS, my usual clothing size is 8 (-10) and I’m 160cm tall. If you have had shirts on loan from the Library that your child no longer fits or needs, please return these to Jo as soon as possible. (There will be a collection point at the next few events). Please be sure to indicate who has been using them, to help us manage our records. If you have a Library shirt on loan – and you would like to keep it for the rest of the season, or for your next child – please also let Jo know. Ensure that she knows the size of the top. This will help us develop an accurate inventory of our stock. If you have any Bushflyers children’s O-tops that you would like to pass on to other children to use, as a donation through the Library, these would also be much appreciated.
. We have families keen to borrow from the Library – let’s use this opportunity to re-stock it and have it functioning well again. 2019 – Your club needs you! A big Thank You goes to everyone who has assisted with the Bushie-organised ACT Twilight orienteering events before Christmas. For those who put their hand up on top of their rostered duties, the events could not have run so smoothly without you. Bushflyers are still presenting two more of the Wednesday Twilight events, on the 13th and the 20th February. This is now a call to all members for assistance with our Orienteering ACT 2019 Main Program events. Organisers, setters, controllers (for ACT League events) and on-the-day helpers all required! Matt Stocks coordinates the roster so please watch for requests for help and consider how you might contribute. Every hour that you are able to volunteer ensures a more successful land enjoyable event for everyone. More generally, if you don’t have experience in a particular role, offering your assistance is a great opportunity to learn new skills and support our sport. I challenge you to give it a go! Don’t sit on the sidelines; we’ll support you along the way. Just let us know if you need a bit of extra guidance. And don’t forget – all helpers will have the chance to run on the day! The Australian Easter Carnival, 19-27 April, based around Perth and Narrogin, WA comprises a range of events, including the traditional Easter Three-Days series of events, and the Australian 3-day Championships on the weekend of 20th-22nd April. Note that some of these annual championship events are being held at Easter this year, because the national Carnival (September/October) will focus on the Oceania Championships. The Easter events are significant selection events for our younger orienteers who have goals of JWOC, and World University Champs, and both weekends also offer challenging and exciting orienteering to competitors all ages. If you are competing, at whatever level, we wish you well. The Bushflyers banner will be flying at all events over the whole Carnival – if you are there, please join us! Bushflyers has a Facebook page. “Like” our page and keep up to date with what’s happening in our club. The OACT AGM will be held on Thursday 28th February. Bushflyers are traditionally well represented in the administration of Orienteering ACT, at a wide range of levels. However, OACT always welcomes new members to the Board or its Executive, or the Council. That new member could be you! For Bushflyers Orienteering – where no-one gets left on the bench!